Learn how to play the sport from professional coaches. Compete in local, regional and national competition. 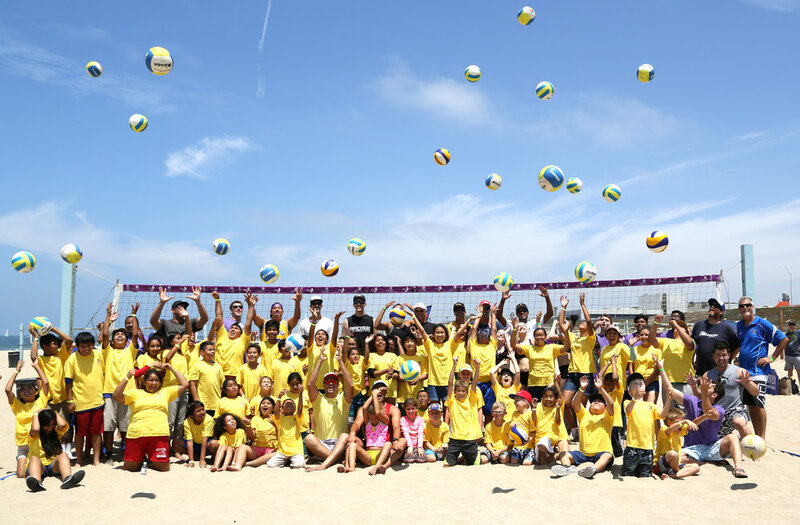 Founder and former professional beach player Jason Olive has been offering free volleyball clinics to children of all ages in groups from 2 -200. In 2019 Los Angeles Volleyball Club begins its competitive beach program. Our Beach Directors Jenny Stone and Stephanie Völckers are former All-American and Hall of Fame collegiate and professional beach players. Beach Volleyball is a more individual sport and we have created a flexible schedule model to allow for athletes to train on their own schedules. We suggest sticking to the Tues/Thurs schedule for Competition and Training Teams however Wednesdays are always an option. LAVBC offers (3) variations of beach training. Our Competition Team trains twice a week for 10 weeks and competes in open competition through USA Volleyball (USAV Beach), the California Beach Volleyball Association (CBVA), the Pro Beach Tour (AVP First) and the Amateur Athletic Union (AAU). Our Beach Training Team trains once a week for 10 weeks and competes on a reduced competition schedule. Our Beginners Beach Team is a non-competition team focused on ages 7-10 and practices once a week for 5 weeks. This team practices on average 2x a week for 10 weeks. This training group will include at least one tournament entered as a team and coached by coaches. Practice sessions are non refundable and must be used in between the dates allotted by LAVBC: JULY 16 - SEPT. 19 2019. Fee includes: Uniform Package and training. Competition fees will be up to each individual athlete and what tournaments they decide to play in and will be paid directly to the tournament sanctioning bodies. Partner choices will be up to each individual player. Coaches will provide assistance where they can with the tournament process. Coaches do not attend tournaments players choose to compete in, outside of club registered events, unless arrangements are made with them. This team practices on average 1x a week for 10 weeks. Practice sessions are non refundable and must be used in between the dates allotted by LAVBC: JULY 16 - SEPT. 19 2019. Additional practice dates can be purchased. Fee includes: Uniform Package and training. Competition fees will be up to each individual athlete and what tournaments they decide to play in and will be paid directly to the tournament sanctioning bodies. Partner choices will be up to each individual player. Coaches will provide assistance where they can with the tournament process. Coaches do not attend tournaments unless arrangements are made with them. This team practices 1x a week for 5 weeks. Practice sessions are non refundable and must be used in between the dates allotted by LAVBC: JULY 16 - SEPT. 19 2019. Additional practice dates can be purchased. Coach Stephanie will hold a warm-down yoga session from 7:30-7:45. This time will be used to teach players proper stretching mechanics and a warm-up/warm-down system they can take with them into the future. This also provides a longer window for pick-up: Fee $5 COP (cash on pick-up). Registration for LAVBC Individual Beach Practice sessions on Wednesdays will open in July. The first available practice date being July 17, 2019.